I was going to title this "Thai Red Turkey Curry" due to the Red Curry Paste recipe I used, however, Dave reckoned my paste look nearly a green as the Green Thai Curry Paste which he had bought in Wing Yip. Personally, being slighltly colour blind, I'm probably not a good judge, but mine definitely looked more Red than Green. If anything, I would say that the bought Green Curry Paste was more Red (but I could be wrong). Either way, Dave decided that it was a Brown Thai Curry, and although he didn't approve of the Cauliflower in it, he did like the Curry, but he still thinks it's a waste of time making your own Paste. Personally, I like making the Paste. It can be made at anytime, just as long as you have the ingredients to hand, and keeps for a month or two in the fridge. The only problem is that although I make enough for 2 or 3 curries at least, I invariable end up having to hand over the leftover Paste to someone who ate some of the curry and wants to make it themselves. Last night was slightly different in that I was cooking at a friend's house, and simply left it behind. 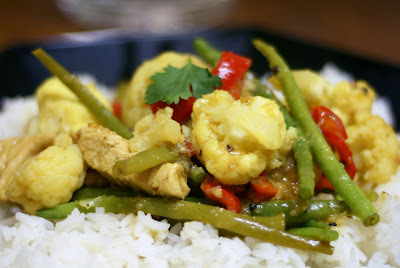 I've made this curry with a variety of variations in the paste and with various ingredients. Turkey steaks were going for a good price, and are supposedly fairly low fat, so this week I figured I'd give them a try again in this curry. I'm not a fan of having Turkey for Christmas Dinner, but I've found that Turkey steaks can be quite versatile for other things. Toast the Coriander Seeds and Cumin Seeds in a dry pan until they start to give off their aromas. Then throw everything into a blender and blend until you have a smooth-ish paste. Decant into a jar of your choosing and store in the fridge for up to 2 months. In a flat based wok, heat up a couple of tablespoons of oil, then when hot, add a couple of good tablespoons of the Curry Paste and cook until the room completely fills with the aroma of the cooking paste (you might need to remove small children and pets from the room at this point). Next add a little of the Coconut Milk and combine with the paste and keep cooking until the oil starts rising through the Coconut Milk. Now add the turkey, then cook for about 5 minutes, stirring into the sauce. Add the rest of the Coconut Milk, bring back to the boil, add the vegetables and stir in. Then cover and simmer for about 30-40 minutes. In the last five minutes, add the Fish Sauce, Palm Sugar and Lime Juice a little at a time and taste to get the balance as you want it. Serve with Jasmin Rice and sprinkle with a little chopped Fresh Coriander. 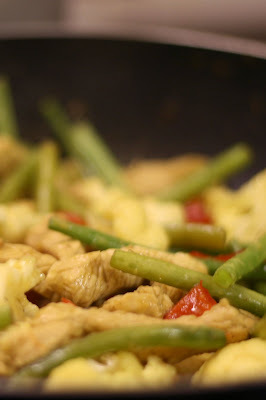 I've found this basic recipe works with a variety of meat and vegetable combinations. I tend to just use whatever looked good in the shop that day. 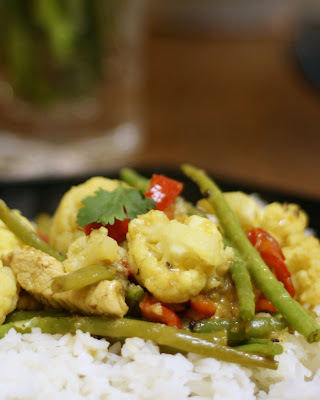 Cauliflower didn't sound particularly Thai sounding, but then it's popular in Indian Curries, it's coming in to season, and I love it, so in it went. Chicken and Bamboo shoots is one of my favourite combinations, but if I've had a chance to get to Wing Yip to pick up some King Prawns, then that is also a nice version (although the Prawns need go in right at the end so that they don't overcook).